the spirit of charity: Haven't the people of Syria suffered enough violence? Haven't the people of Syria suffered enough violence? 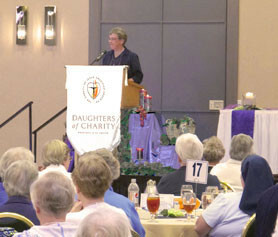 Daughters of Charity from Texas to New York to Florida traveled to St. Louis for a provincial meeting. We joined with Pope Francis in fasting and prayer very mindful of our Sisters and others suffering in Syria. United as the Province of St. Louise, we share the following corporate statement which we agreed to while at our meeting. In response to the horrific violence in Syria, we, the Daughters of Charity of the Province of St. Louise – USA call for a diplomatic and humanitarian intervention in concert with the international community. We steadfastly oppose a violent response in an already devastated country. Let us continue to pray as we see greater unity among nations as to handle this horrendous situation without causing greater suffering and more widespread war and violence.